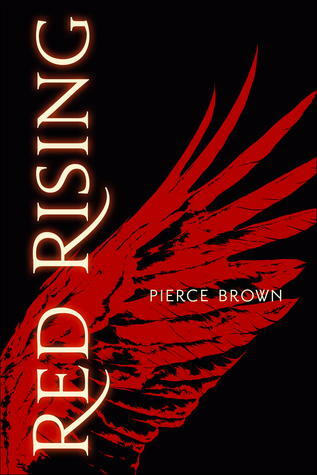 Red Rising, a debut novel by Pierce Brown, is a dystopia set on Mars and the first book in a trilogy. I’ve seen it being referenced as a young adult book a few times, but as far as I can tell, it is not being sold as a young adult novel. The publisher’s website does not list it as such so if you are looking for it in a bookstore, I don’t think it will be found in the young adult section. As a Red, Darrow spends his life underneath the surface of Mars, mining for helium-3. The Earth is dying, and as humankind is finding new homes on other planets, the Red miners are performing a vital role by providing the element necessary for terraforming Mars. The Golds, the highest group in their society, tell them that their sacrifice will allow other humans to someday join them, and they will be able to live on the surface of the planet where the Reds will be revered for the toil and suffering that made this new home possible. Darrow works hard and takes risks in order to win the Laurel, a prize given to the team that mines the most helium-3 in a quarter. Another team always wins it, gaining prestige, food, and extra luxuries for their families. Darrow manages to give his team the lead during a quarter, but his dreams of glory and tasty treats are dashed when the award is still given to the same group as always. At first Darrow is upset by this injustice, but he soon decides it doesn’t matter. After all, he has his wife and his family, he’s not on the doomed Earth, and he’s content to pave the way for future generations to live on the planet. However, Darrow’s wife Eo is not content with their situation, claiming they live as slaves and urging Darrow to act toward freeing them. Darrow disagrees with her assessment and doesn’t see why he should do any such thing; his own father was hanged for rebellion, and it didn’t change anything other than leaving him fatherless. After a great tragedy, Darrow is recruited by the Sons of Ares, a rebel group that shows him how deeply the Reds have been misled by taking him to the surface of Mars and showing him that it is already populated. The Sons have a plan for Darrow and he agrees to be forged into a Gold—and if he is one of the few who survives the process, they hope that he will be accepted to the Institute and succeed, eventually rising to a position that will allow him to serve Ares from within. Red Rising is an absorbing novel from start to finish. It begins with a brief glimpse of Darrow’s infiltration of the Institute before telling his story linearly beginning with his time as a Red, and it keeps getting better and better until it reaches its conclusion. While I thought it could have been better in some areas—namely characterization, especially of secondary characters, and world-building—I very much enjoyed it and am looking forward to reading the next book. I thought one of the things that made Red Rising so compelling is that life isn’t great for anyone, even those close to the top of its hierarchical structure. The Reds risk their lives mining helium-3 and are forbidden from certain activities, everything from visiting certain places to singing a specific song to burying those hanged for such actions. However, as Darrow discovers, Golds inhabit a brutal world, particularly those trying to achieve any sort of status. Many of the young people at the Institute belong to important families, but that doesn’t always protect them. There is a literal culling at the Institute, in which some students are killed by others since they’re told a limited number of spots are available in class. After this, the students are divided by their Houses and must win by conquering the others. Although killing is discouraged at this point, it’s also expected that there will be some casualties—as long as they don’t exceed a set number of deaths, no one will get too upset over this. There is a large Roman influence in their society, and I would have loved to have learned more of the details of the shift that lead to this. While I was glad there wasn’t a lot of awkward infodumping, I also would have liked to have seen this developed further and I’m hoping the remaining books delve more into the history of the worlds. As it was, it seemed more like Roman influence was added because it was familiar rather than because it was an integral part of the society. Darrow’s situation is quite unbelievable, and he seemed too perfect. I found it quite implausible that someone who spent his entire life of 16 years isolated from those on the surface of the planet could not only adapt so quickly but do exceptionally well on the test for their prestigious Institute. It is clear that the test is focused more on solving problems involving innate intelligence rather than facts, and it is also mentioned that Darrow took some sort of potion that allowed him to “wake knowing three thousand years of literature and legal code and history” (pp. 92). Even with the ability to technomagically gain knowledge, I find it hard to believe that one could just integrate into an unfamiliar society, fit in, and excel no matter how intelligent they were. He’d barely even socialized with Golds, and the biggest point that kept coming up as a difference between the Reds and Golds was that Darrow had to keep remembering to say “gorydamn” instead of “bloodydamn,” which seemed like it should be one of the smaller differences he’d have to deal with to me. While the quickness and convenience of Darrow’s entry into Red society had me rolling my eyes, Darrow didn’t end up being quite as flawless as I’d initially feared after reading about how amazing he did on the test since he did make mistakes—and he learned from them as he went, and part of the reason he got by was a bit of luck and other people. This made the book more exciting and Darrow more compelling than I expected since I was anticipating he was going to be one of those characters who outsmarted everyone else with ease. I still had issues with too much perfection and the willingness of others to follow him, but it at least kept him from being overwhelmingly better than everyone. There were not a lot of standout characters and most of the secondary characters did sound somewhat alike instead of having distinctive personalities and voices. Eo with her determination and ideals was one of the more memorable characters, and she wasn’t even present for most of the book. The only other secondary character I felt was at all memorable was Mustang, a young woman at the Institute, but she doesn’t appear until later in the book so I’m not going to say anything more about her. Red Rising required a lot of suspension of disbelief on my part, especially when it came to the main character’s quick rise from a helium-3 miner with no knowledge of the Golds on Mars to one of their best and brightest. However, it completely succeeded as a well-paced, entertaining novel with a storyline that grew more intense throughout. Despite my reservations, I found it compulsively readable and do really want to read the rest of the trilogy once it’s available.